I don’t have one yet, but I’ve been eyeing out the onesies I’ve found in the shops and online… and I know there have been a few people asking about them, so I thought I’d do a blog post showing where I’ve found them. Now to be honest, I’m fascinated onesies. Yes, I can imagine that they’re warm and cuddly and to be frank, they be most divine to spend my evenings wearing them while I’m editing, because it’s not the warmest activity to do in the midsts of a Gauteng winter with our homes designed for hot summers. So, I’m tempted to buy one… the only only issue I can forsee… how on earth do you not freeze your tootsies off when you need to go to the loo?!! 1. Sass Designs: I just love Sass’ dresses, so I love that she’s also selling onesies, hers look uber comfy and they’re made from fleece so they’re definitely warm and you can get them for men too! 2. Mr Price: Has to be mentioned that at R139 these have to be the cheapest I’ve found. Although the cotton option looks rather chilly to me, and the leopard print option, although it’s fleece, looks a little meh compared to the other options out there. Hmmm and it looks like they’ve removed it from their online store within a few hours of it being posted on Facebook. 4. One Piece. These can be imported from Norway, and my word they’re expensive, but if you want to wear a brand that seems to be worn by loads of celebs, then this is the one for you. 5.Woolworths. Just as I thought you couldn’t get ones that looked like babygrows, here are some from Woolies… at R250 with covered feet! Hmm, not so sure, I think I prefer the leopard print onesies they had in stock a few weeks ago more than this. 6. 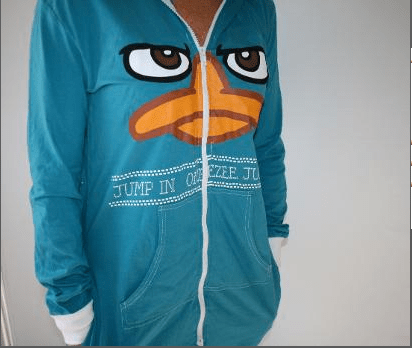 Onezee – hey this place has Phineas and Ferb onesies!! Anyway, I think I’ve found enough options now… are you as fascinated as I am? Do you have one? Are you going to get one? Being in the UK, one must have one they are freely available. I find them especially cold when you need to go to the loo. If you do get one, suggest wearing a vest of some sort underneath them, that way when you need to go, you don’t freeze.. Happy shopping!! Love the Phineas and Ferb onesies, but in all honesty I am still in two minds in general about onesies. You might hate me for this, but the thought of a man in a onesie takes me back to the Carte Blanche episode of men with nappies in cots with bibs. In Oz they have ones with bum flaps (think old school men’s long johns) so that when you need to go to the loo at night you just have to unbutton the flap. I think if I could find something like that over here I would be tempted. I’ve seen one company here that has those… they call them bum-sies! LOL! I really had a look at these but will not be getting one. Honestly it mus tbe worse getting out of them and going to the loo than the warmth it gives you otherwise. Also – total passion killer. They look warm, but once again, when you need to pee then what! My nieces all have them! I am dying for one to put over my jarmies when I’m watch telly, or reading my book! They’re so cozy and warm! I love onesies, I wear mine all the time! I am so glad mens onesies are coming into fashion now! Love it haha! !